Art that heals & stories that reawaken dreams. Art that opens your mind & heart. Art that energizes your soul. The artworks you will find here are talismans. These unique paintings and drawings are the kind of talismans for your heart and soul that last a lifetime and beyond. • Paintings that are talismans for true freedom. • Drawings that are talismans for inspiring hope that brings more love and light into the world. • Art prints that are talismans for strength to make your dreams come true, and talismans for empowering you to simply and beautifully be – you. • And you can commission your very own original talisman in the form of a visionary portrait. Discover beautiful original paintings, drawings, and limited edition prints in the Art Shop. 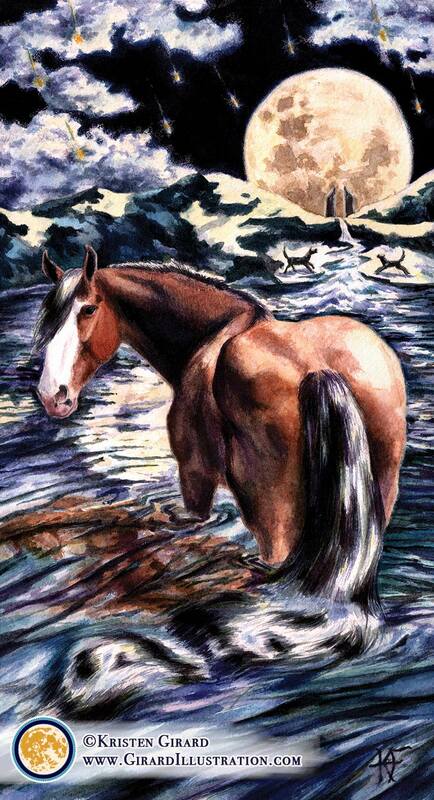 Paintings that honor the animals you love, and bring the awe of being with into your favorite places. It’s time to laugh and enjoy being alive! Your true dreams becoming a reality is the key to healing our sacred planet. Helping you find freedom and bring freedom to others is what I do. Awakening and reinvigorating the light of hope when all seems dark is my mission. Helping you discover and acknowledge your beautifully fierce strengths is what the art and stories you will find here are all about. Empowering you to truly and actually love yourself and who you are from the inside out - to awaken you to a deep inner knowing of your own self-worth that needs no outer validation keeps me inspired. We’ve just met, but something you should know is that as an artist one of my strengths is painting the energies, emotions, and dreams that hold the truths of who we truly are, and what those visions mean. It’s something I discovered I could do by accident during some of my darkest moments and being able to use this ability has helped me so much I want to help you, too. I can do that best by creating an original painting or drawing for you that reflects who you are becoming so that you have a source of strength and inspiration when things get tough. Art that frees you to be you. Art that encourages you to feel really good about the incredible person you are. Art that helps you reawaken your beautiful dreams and make them come alive. Art that is a talisman for you to see everyday and remember who you are here to be. It’s time to be you - because no-one else can - and you are the only one who can heal that world in your unique ways. Seriously, if you love nature, goddesses, and dinosaurs and have a sense of humor and deep desire to live life in harmony with who you truly are - you have found your people - and your artist + story weaver! Give your home some personality + attitude. save monarch butterflies, humpback whales, & wild horses. We respect your privacy and protect it fiercely like librarians protecting special collection books. Proceeds from every sale of art + stories go to fund biodiversity conservation efforts, environmental clean ups, & protect animal migration paths. Feel like a goddess in your home. It's time your home reflected who YOU are & what YOU love. • Energize your home with warmth and natural magic. • Be a champion for Mother Earth. Are you ready to be a vibrant goddess of nature? Sign up for beautiful inbox letters that help you live in harmony with nature, create a home you love, and bring a breathe of fresh air to your dreams. We respect and protect your privacy like Tyrannosaurus rex mothers defending their chicks. So glad you decided to come on this wonderful art and story adventure with a mission to save the whales! Kristen Girard is founder & lead creator of Girard Illustration. As an artist, writer, illustrator, & deep appreciator of the great outdoors Kristen is on a mission to help both nature and humans thrive together in harmony + joy.